Your upcoming movie The Night Monica Came Back - in a few words, what is it about? It's about a group of teens going on a camping trip where two people die in mysterious circumstances. 20 years later, the gang meet again as one of those who were on camp is determined to find out what really happened, and who is behind the deaths. I run Northern Star Acting, and we always want to create awesome opportunities for our students. I got in touch with Laurence R. Harvey (Human Centipede 2 and 3) and asked him if he would be involved in the project, he said yes and it wasn't until after then that it was written by some crazy Austrian dude. 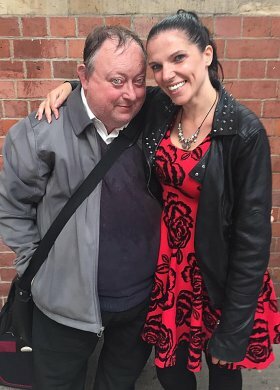 Apart from Laurence R. Harvey, who plays Pops, and me playing grown-up Christine, they are all student actors who are at the beginning stages of learning their craft. For some, it was their very first time in front of a camera but you would never think this from watching the film. They really delivered and were outstanding! The Night Monica Came Back stars kids aged 8 to 17 - so why pick of all genres horror? I have been criticised for making a horror with kids in but it was a great, and very valuable experience for them. My decisions will always be based around what is best for my actors and nothing else. Horror is a very important genre for actors - they are all very likely to be cast in a horror film at some point as it's, by far, the most popular genre for independent films. If we didn't cover horror, they wouldn't be getting the education they need to prepare them for the real world. Plus, they really wanted to make a horror and were dead excited about it! Some might find the idea to cast of all people Laurence R. Harvey, star of Human Centipede 2 and 3, in a movie starring a bunch of kids controversial - so what was the idea behind that? Oh yes, people have had very strong opinions on this. They either think it's great or are very opposed. Sometimes I wish think people can struggle to see that actors are just playing roles. The idea behind it was simply that he is an incredible actor who our tribe can learn a lot from. What was working with Laurence R. Harvey like, and how did you get him even? I was in a film called Banjo by Liam Regan which Laurence was in playing the role of Clyde. Although I never actually shot any scenes with him then, it's how we ended up connected. He is a really lovely guy. Very funny and ridiculously talented. I am hoping to work with him again in the future. You also appear in front of the camera in The Night Monica Came Back - so do talk about your character for a bit, and what did you draw upon to bring (grown-up) Christine to life? I loved my character - she's psychotic, a narcissist and sooooo much fun to play! The way she sees the world is so different to anyone else and I loved getting in her head and figuring out what makes her tick. Do talk about the rest of the cast as well then! Ah my amazing tribe J These guys are just so passionate and dedicated. They are big thinkers and have the best attitudes. They will go far! Shooting with children - what are the challenges there, and how did you keep them occupied outside the actual shoot? Well you know how they say never work with children? Not true in our case. They were focused, they worked hard and were so professional throughout. I'd film with them again in a flash! 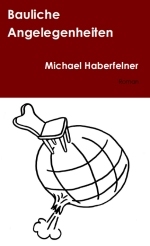 Do talk about the screenwriter of The Night Monica Came Back, a certain Michael Haberfelner [who would be me, so yes, I'm fishing for compliments here ;)] [Michael Haberfelner interview - click here], and why him, and what was your collaboration like? Michael Haberfelner aka Dr Evil is a total mad man. I'm not sure if he's a creative genius or slightly insane but I do know that his scripts are absolutely hilarious! Also on my behalf, you of course have to give a big shout-out to the rest of your fabulous crew! This film had two directors - Layla Randle-Conde [Layla Randle-Conde interview - click here] and Cameron Prudames and they were both just outstanding from beginning to end. I also want to mention Jennifer Challinor who was so great with the kids and was a total superstar behind the scenes. A few words about your locations, and what was it like filming there? On as always, it was full of laughter, positivity and energy! Parts of it were very intense with us racing against time but I honestly couldn't have wished for a better group of people. 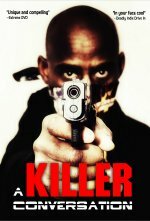 Any idea when the film might be released onto the general public yet? 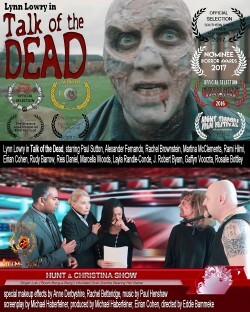 We are aiming to send it out to festivals in 2017 and then to TV networks so keep an eye out! Any future projects beyond The Night Monica Came Back you'd like to share? 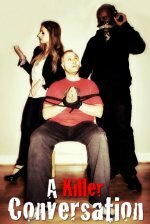 Well, we are back shooting with Lynn Lowry in November as she joins us for another project, First Impressions Can Kill, which is absolutely hilarious! Also, Inside Fear, our psychological thriller, is almost complete - YAAAY!!! You of course have to talk about your comany Northern Star Acting for a bit, and what do you think sets it apart from other acting schools? And what inspired you to run an acting school in the first place? Northern Star Acting is not just another acting class. We are a tribe of badass actors, ready to take the world by storm! We train in acting but also in business, mindset and even health & fitness because we firmly believe that these aspects all play an important role in actors maintaining a long term career. YES!!! We are auditioning now for new tribe members to join our acting for film and television training program and we also offer online training for budding actors to be able to join us from anywhere in the world. Contact info@northernstaracting.co.uk for more info!